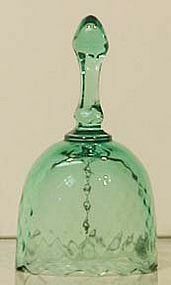 This hard-to-find Fenton Green Opalescent Hobnail Slipper (Puss'n Boots) is from the 1950's. It measures about 5.5" in length and in mint condition. 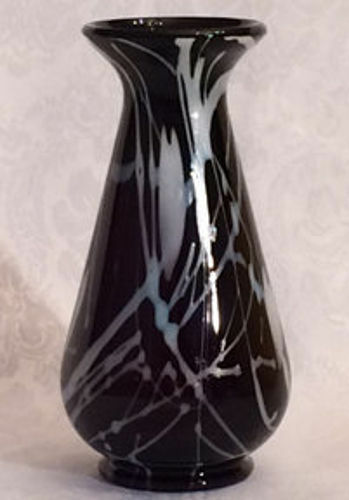 Fenton Green Opalescent Hobnail Swung Vase, 16.5" tall -- this is the tallest swung vase in green that Fenton made in the 1950's. It is in mint condition. 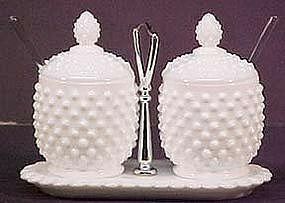 Fenton's milkglass was made from 1952 up through the 90's. This jam and jelly set is in excellent condition (#3915). Included pieces: 2 jelly/jams with covers and original spoons, handled tray. Produced in 1969. 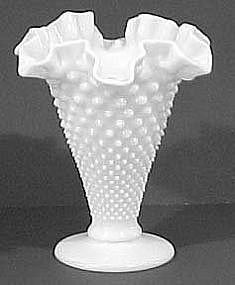 Fenton Hobnail Milk Glass double crimped 8" Vase produced in 1967. 7" at widest. In excellent condition. 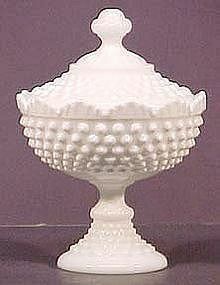 This Fenton milk Glass hobnail covered candy was produced between 1972 and 1990. It does have the logo on both pieces and is in excellent condition. It measures 6.5 inches wide and, with cover, is 6.5" tall. 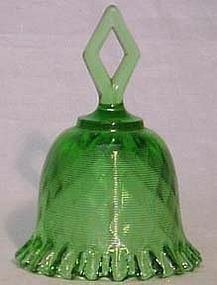 Fenton made this pedestalled covered candy from the late 1950's through the 70's. 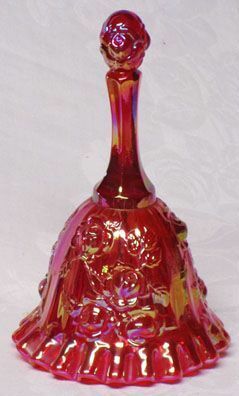 It stands about 8.5" tall and is 6" across at the widest. In excellent condition. Fenton's milkglass was made from 1952. 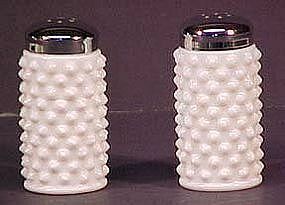 This pair of shakers are in excellent condition with excellent tops. 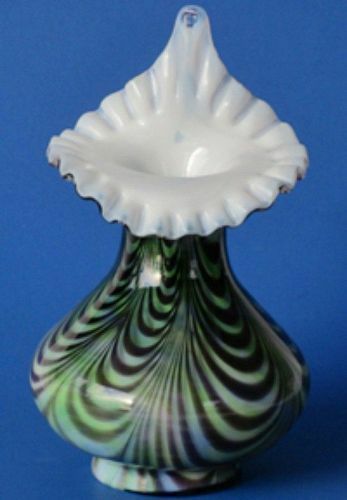 Fenton reintroduced this pattern for their 100th Anniversary in 2005. It was never before pressed in red carnival. 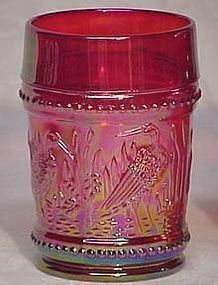 Measures 4" tall, has logo on bottom, in mint condition. 3 are available. 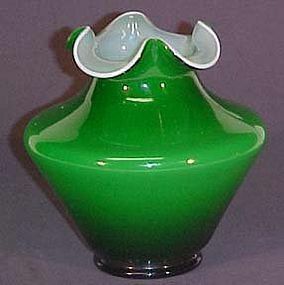 Fenton made Ivy Overlay from 1949-53. 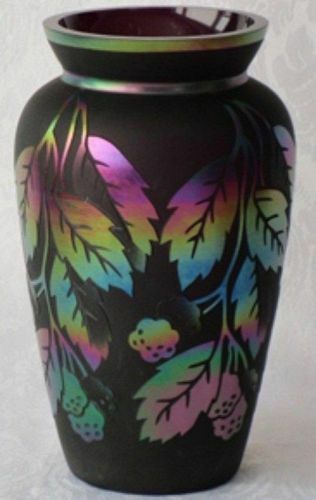 This vase is 5.5" tall and in mint condition. 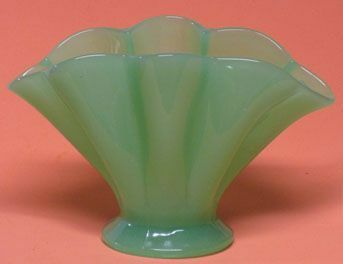 Fenton made jade green in the mid 1920's and beyond. 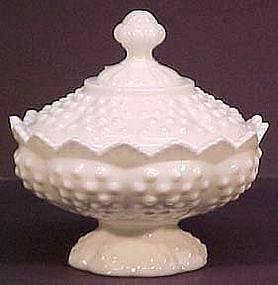 This bowl ringed was produced in the 1920's. 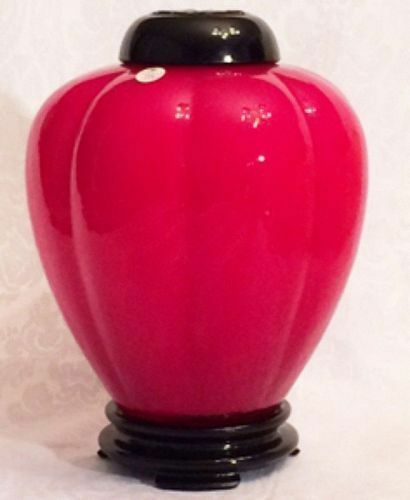 It is in mint condition measuring 7" in diameter and stands on 3 toes.